Bring on those lazy, hazy, crazy days of summer! We all love the summer season but, sometimes, the weather can get a little too hot to handle. You may have a beautiful backyard, but if the sun is too strong, how can you enjoy it? 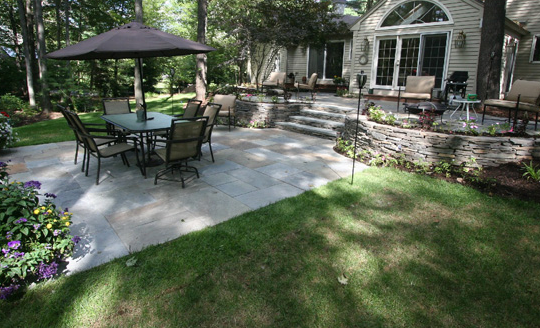 By creating some shady areas in your backyard space, you will not only protect you and your family from harmful UV rays, but you will also save on your energy bill, if you plan things properly. Since shade automatically lowers the temperature by cooling the area that is shaded, this in turn, will lower the temperature of your home and therefore lower your use of your air-conditioners. Some people are not sure of the options that are available to them so, here are some ideas on how to bring some shade to your backyard that you may want to consider. It is well known that shrubs placed around the house will help lower your energy bill, but shrubs planted anywhere in the garden can also bring some much needed shade. Although shrubs are not as high growing as trees, they can still help to cool of a garden walkway or sitting area. Trees are not only beautiful and offer great shade but they also offer more oxygen for you and your family. The problem that some people have with the idea of trees is that they need time to grow and also need some necessary maintenance. There are several fast growing shade trees that will be right for your location. Ask your local nursery which tree they think might be good for your yard. If you choose a larger tree to start out with, it will not take as long to grow to a nice height. If you plant your tree to the south of your backyard, it will help you to keep your house shaded as well. If the tree is a deciduous tree, it will lose its’ leaves in the winter which will allow some sun to come through and warm your home up by a few degrees. Wooden pergolas are very popular, but they can also be purchased in aluminum and steel? Aluminum and steel pergolas require less maintenance than wood, but if you want a more natural effect then wood is probably your best bet. It really all depends on your personal taste. Most pergolas are open at the top, so many people wonder if they will get the amount of shade that they really want. If you plant some fast growing vines, you can train them to grow up and over the top beams. Another alternative would be to add a vinyl lattice or a cloth canopy on top. If you live in a very rainy area, cloth may become a nuisance, as it will collect rain and stretch. Gazebos are similar to pergolas, but most pergolas have a rectangular shape whereas gazebos are mostly octagon shaped. Gazebos are installed with a domed roof and you can have curtain panels or mosquito netting installed which can be tied at the corners and pulled closed or open as you choose. Umbrellas come in many sizes and colors so you can generally find one that meets your needs. They are great over a dining area and a small umbrella can easily attach to the back of a chair for instant shade. With such a variety of affordable solutions at your disposal, all you need to do is decide on the best choice for you, then go out there, and enjoy your summer. Bring on the shade!